Shakouri, M., Bijeh Keshavarzi, M., Feiz Abadi, A., Lotfi, M. (2014). The Effect of N Fertilizer and Plant Density on Green Peppers Yield and Its Components. International Journal of Advanced Biological and Biomedical Research, 2(3), 586-590. Mohammad Javad Shakouri; Mohammad hossien Bijeh Keshavarzi; Akram Feiz Abadi; Mahbob Lotfi. "The Effect of N Fertilizer and Plant Density on Green Peppers Yield and Its Components". 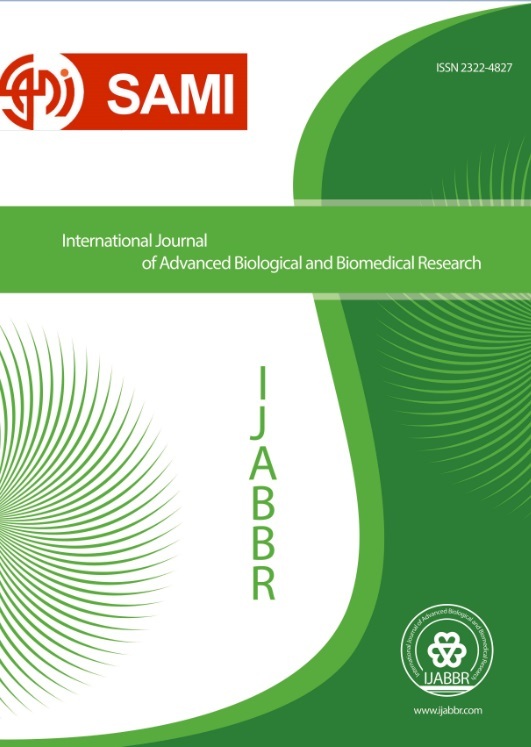 International Journal of Advanced Biological and Biomedical Research, 2, 3, 2014, 586-590. Shakouri, M., Bijeh Keshavarzi, M., Feiz Abadi, A., Lotfi, M. (2014). 'The Effect of N Fertilizer and Plant Density on Green Peppers Yield and Its Components', International Journal of Advanced Biological and Biomedical Research, 2(3), pp. 586-590. Shakouri, M., Bijeh Keshavarzi, M., Feiz Abadi, A., Lotfi, M. The Effect of N Fertilizer and Plant Density on Green Peppers Yield and Its Components. International Journal of Advanced Biological and Biomedical Research, 2014; 2(3): 586-590.
Pepper is one of the nutrition demanding vegetable. In order to compare N fertilizer uptake and plant numbers per area unit, an experiment was conducted with replications. In which fertilizer was the main factor and included Ammonium nitrate in 7 levels (0, 80, 160, 240 kg /ha-1) and 40+40, 80+80, 120+120 kg/ha-1 (in 2 stages i.e. Half of these amounts appliedpre planting and the other half of itside dressed in flowering stage).The second factor (plant density) comprised of 3 levels (25000, 35000 and 50000). The data such as: fruit numbers per plot and per plant, plant’s height yield per plant, fruit weight and prematurity percentage were detemined. According to the results simple and interaction effects of factors on yield and fruit numbers were significant, but N fertilizer had no significant effect on plant’s height. Data means comparison showed that green pepper’s yield was 100% higher than the control when using 240 kg N ha-1. Resultsalso showed that by increasing the plant numbers per area unit, the yield of each plant and fruit numbers in each plant were decreased. Adetula, A.O., and Olakojo, S.A. (2006) Genetic characterization and evaluation of some pepper accessions Capsicum frutescens(L): The Nigerian.American-Eurasian Journal Agric. & Environ Science1(3), 227-281. Agheli, N. (2005) Principlesofnutrition and dietcompositionof food.Guilan University of Medical Sciences, 124 pp. Ali Ahmadi, H., Jahantighi, H., Rostami, H. (2004) Study on Yield of Sweet, Green and Salad Pepper Cultivars in Sistan. Seed and Plant Improvment Journal. Cavero, J., Ortega Gil, R., and Gutierrez, M. (2001) Plant density affects yield, yield components and color of direct-seeded paprika pepper. HortScience 36(1), 76-79. Csillery, G. (2006) Pepper taxonomy and the botanical description of the species.ActaAgronomicaHungarica 54(2), 151-166 . Cushman, K.E., and Horgan, T. (2001) Plant population affects bell pepper yield. Annual report of the North Mississippi research & extension Center, Miss. Agric. &ForExperimentalstation information bullten. 375. pp. 294-295. Dimitrov, Z., and Chervenkova, Z. (1978) The effect of cultural practices on the yield and quality of Capsicum.Horticultural abstracts.no 2. Guertal, E.A. (2000) Preplant slow-release nitrogen fertilizers produce similar bell pepper yields as split applications of soluble fertilizer. Agronomy journal 92, 388–393 . LibnerNonneke. (1989) Vegetable production, Horticulture University of guelph, Ontario, Canada. Motsenbocker, C.E. (1996) In-row plant spacing affects growth and yield of pepperoncini pepper. HortScience 31, 198-200. Nyambi, G., Koona, P., Egunjobi, J., and Awodoyin, R. (2004) Growth and frequency and plant spacing.Trop. Science 44, 92-94. Peivast, Gh. 2005.Olericulture, Gilan University Pub, 487 pp. Rodriguez, Y., Depestre, T., and Gomez, O. (2008) Efficiency of selection in pepper lines (Capsicum annuum), from four sub-populations, in characters of productive interest.Ciencia e InvestigacionAgraria 35(1), 29-40. Patricia Toquica, S., Rodriguez, F., Martinez, E., Duque M.C., and Tohme, J. (2003) Molecular characterization by AFLPs of Capsicumgermplasm from the Amazon department in Colombia, characterization by AFLPs of Capsicum.Genetic resources and crop evolution 50, 639–647 . Supanjani Lee, K.D. (2006) Hot pepper response to interactive effects of salinity and boron. Plant soil environ. 52(5), 227-233 . Thomas, James, R., and Marvin D. Heilman. (1964) Nitrogen and Phosphorus content of leaf tissues in relation to sweet Pepper yield. proc. Amer. Sco. Hort. Sci. 419-415. YildizDasgan, H., and Abak, K. (2003) Effects of plant density and number of shoots on yield and fruit characteristics of peppers grown in Glasshouses.Turkey Journal Agriculture 27, 29-35.